Those lost during World War I remembered at highly symbolic and emotional ceremony at British and German Cemeteries in Chacarita, a century on from the armstice that ended the fighting. Venables went on to say that all the vows never to repeat the millions of dead from the “war to end all wars” via education and technological progress had proved in vain because they had reckoned without original sin, ultimately leading to God. Reconciliation also had to overcome the obstacles to communication arising precisely from modern communications technology, namely the ubiquitous smart phone, he said. In a rather more jocular tone, the archbishop advanced two proofs for the existence of God – that his prayers had prevailed over the forecasts of stormy weather and the miracle of the British Legion’s Ronnie Scott (who was later to read the “We shall remember them” tribute) having just obtained a five-year renewal of his driving licence. Not much variation from the annual Poppy Day service while the ceremony remained in the British Cemetery – the customary hymns, prayers (with Presbyterian elder Douglas Robertson and Father Rubén Suhr from the German community seconding Venables) and the traditional tributes (Scott followed by the Kohima Epitaph read by Korean War veteran Charles Yatman from the American Legion). Almost the only innovation until that point was the list of all the Franco-Argentine war dead (whether immigrants here or of French origin) read by defence attaché Lieutenant-Colonel Pierre Yves Derangère – a list so long that even though he only read out surnames, there were fears that it might overrun the precise Armistice hour of 11am. But the two minutes of silence scheduled for the exact moment were heeded 15-20 minutes early in a ceremony accelerated by weather fears. Wreathes were then laid by the ambassadors of Germany, France and Britain (Jürgen Mertens, Pierre Henri Guignard and Mark Kent respectively), their defence attachés and representatives of the veteran associations of the three countries. 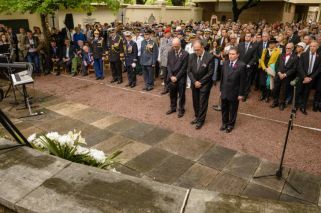 But not just the diplomats of those nations – various ambassadors accompanied the trio, whil the defence attachés of the United States, South Africa, Russia, Italy and Canada joined their three colleagues in the front row with others behind them (every attaché in Buenos Aires from all three services was invited) also paid their respects. It was at that point that history was made anew during this historic centenary when Kent and Mertens ceremoniously opened the gate recently constructed in the wall between the two cemeteries in a supreme gesture of reconciliation as the commemoration moved to the German side of the wall. While crossing over this reporter quickly glanced around the graves on both sides. “British Cemetery” comes close to being a misnomer – you do see plenty of surnames like Goddard, Reid or Smith but they are almost a minority. Among the various other nationalities there are numerous cases of the tell-tale “ian” ending of Armenian surnames, at least one tombstone totally in Cyrillic and even a Japanese (German allies in the other world war). But most remarkably there was no lack of German names on the British side. Some predated the division, some were the result of intermarriage but, as Harry Ingham pointed out, after 1933 no German Jews wanted to be buried in what should have been their cemetery. Ingham also commented on how well-kept the cemetery now was after having seen it very run-down on his last visit several years ago – the two men do not know each other but this is a tribute to the work of Andrew Gibson, British Cemetery manager since 2012. On the other side both the cemetery and the ceremony were more distinctly German with less diversity in the headstones. There is even an Iron Cross on the war dead memorial and a gate has been opened rather than a wall brought down but reconciliation is clearly underway. Manifest in “Danny Boy” sung in both German and English by the Deutsche Schule Ballester (“Imagine” and “It’s a long way to Tipperary” had been sung earlier in the British half of the ceremony) and in the “Totengedenken” memorial text read out by Ambassador Mertens – delivered in German but politically correct, paying tribute not only to those killed in battle but also those “murdered for belonging to another race” or “in the resistance to despotism.” Mertens followed this up with words of memory and reconciliation revolving around the symbol of the memorial flower forget-me-not. The rest of the ceremony consisted of letters from the front, a prayer by Lutheran pastor Karin Krug, more wreathes from the ambassadors and defence attachés, a minute of silence and “Eternal Source of Light Divine” sung by another Karin (soprano Thorhauer) before Lieutenant-Colonel Christian Conrad brought this momentous event to a successful close. The letters were written by a wounded British captain relishing the comforts of hospital life with his war safely over before dying from complications six days later, an American expressing his amazement at being on German soil around the time of the Armistice, a French “poilu” who had lost all sense of time among everything else and a German soldier trying to cling to the idea of reason and humanity amid all the inhumanity and insanity. Yet the last word did not belong to Conrad – Ambassador Guignard ensured that with a splendid reception in the palatial French Embassy. Those arriving early from Chacarita were entertained by a “poilu” in the “horizon bleu” blue-grey uniform of World War I and a vintage car in the style of the Paris taxis used to rush troops to the Battle of the Marne in 1914. In his speech Guignard underlined the importance of reconciliation with the past after all the traumas of two world wars in the last century but also reconciliation with the next century, tackling both the challenges to governance raised by this week’s Paris Peace Forum and to the environment as in the 2015 United Nations Climate Conference hosted by the French capital.